DG/health Naturals baby Cough Syrup + Mucus may have a bacteria that, in rare cases, could be deadly. A brand of baby's cough syrup sold nationwide at Dollar General stores is being recalled because it may be contaminated with bacteria that could lead to vomiting or diarrhea and, in rare cases, could be fatal. 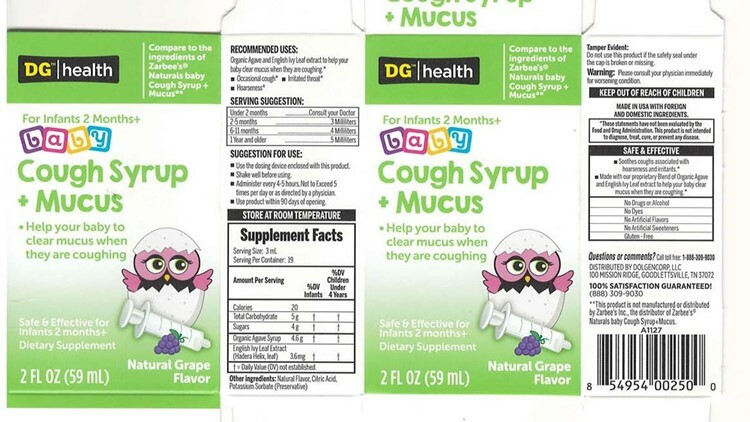 One lot of DG™/health NATURALS baby Cough Syrup + Mucus were recalled because of a possible bacteria contamination, March 20, 2019.